By the end of winter that old joke about gardeners having hinged spines has stopped being funny. We’ve spent too many weeks bent double, cutting down perennials or crouching to admire the snowdrops and the hellebores. Most plants that flower at this time of year tend to be close to the soil because the low light and cold days favour short stems. By far the easiest to grow and the longest flowering of these dwarf plants are the miniature narcissi. I grow them in terracotta pots, grouped on a table near the house, where I can appreciate their delicate beauty up close, without having to bend down. Even in very small spaces a collection of dwarf narcissi in pots cheers up the dullest spring day. 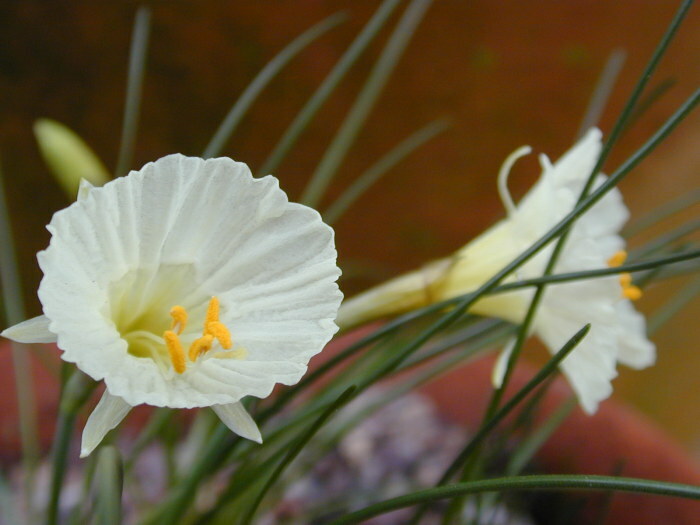 The first to flower are the bright yellow Narrcissus ‘February Gold’ and its paler sister N. ‘February Silver’. 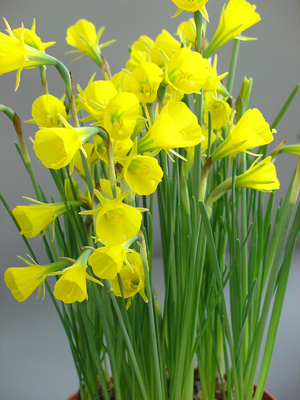 They belong to the cyclamineus group of narcissi and will grow in either sun or shade. Although only eight inches tall they hold up their heads even during bad weather. The parent of this group of cultivars, N. cyclamineus, has petals that are folded back along the stem like the ears of a frightened puppy. On N. ‘Jack Snipe’ these reflexed petals are white, while the cup of the flower is primrose yellow. Years of failing to replicate a southern-European meadow, filled with the hoop-petticoat daffodil, N. bulbocodium, has taught me to stick to growing them in pots. The dark-yellow N. bulbocodium ‘Golden Bells’ is the most floriferous of this group of elegant flowers. N. ‘Nylon’, as its rather unpleasant name suggests, has diaphanous cream petals. Many narcissi produce more than one flower from each bulb. N. ‘Hawera’ has a cluster of buttercup-yellow flowers on each stem in mid April. As an added bonus the flowers are deliciously scented. N. ‘Petrel’ is a taller (10 inches) milky-white version of ‘Hawera’ with the same perfume. 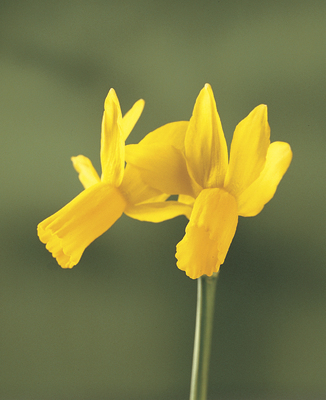 There are dozens of dwarf narcissi to choose from, the most common being N. ‘Tete a Tete’. Those grown in small pots of sand, that you can find in florists shops and supermarkets at the moment, have been mollycoddled and overfed to force them to flower. If you look around specialist nurseries you can find far more beautiful flowers than ‘Tete a Tete’. My own favourite is a little rarity called N. cautrecasasii var segimonensis, which I picked up at a plant fair for £1.50. Just three inches tall it has pale-cream crimped tissue paper flowers at the end of January. It’s a little gem. Because growing dwarf narcissi in pots is so easy, they are a good choice if you want to introduce children to bulb growing. Put a label with the child’s name on into the pot to remind them that these are the flowers from the bulbs they planted back in the autumn. Forty years on from the first time I planted mine, the magic of seeing them flowering returns every spring. Plant bulbs in the early autumn to a depth about three times greater than the height of the bulb. For most dwarf narcissi this will be 4 – 6 inches. Plant the bulbs closely together, certainly no more than four inches apart. In pots and containers good drainage is important, so place broken pots or pieces of polystyrene in the bottom of the pots. Use a compost that has lots of horticultural grit incorporated. During the summer keep the compost dry. Let the leaves die back naturally. This feeds the bulbs for the following year. Tying the leaves in knots or cutting them off while they are still green will weaken the bulb, resulting in fewer flowers. Removing the dead flowers will help produce stronger bulbs for the following year. The bulbs of N. cyclamineus bulk up very slowly, so you may want to leave the flowers on to produce seed. Prepare to wait about five years before any seeds that germinate flower.